Once a minor chord has been established, a Diminished chord is just one step away. Simply take any Minor chord, and lower its fifth one half step. In the same vein of thought, a Diminished chord is only two steps away from a Major chord. Just take a Major Chord, and lower both the third and the fifth one half step, and you're there! Find the notes of the D minor chord (D, F, and A). Lower the fifth one half step, turning the A into a Ab. Therefore, the notes D, F, and Ab make up a D Diminished chord. Find the notes of the D Major chord (D, F#, and A). Lower the third one half step, turning the F# into F, and lower the fifth one half step, turning the A into a Ab. Using either process (beginning with a Major chord, or beginning with a Minor chord) results in the same notes, D, F, and Ab, and make up a D Diminished chord. Let us follow the same procedure to make an Eb Diminished chord. 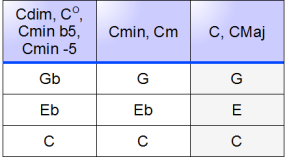 Find the notes of the Eb minor chord (Eb, Gb, and Bb). Lower the fifth one half step, turning the Bb into a Bbb (yes, this is a double flat). Therefore, the notes Eb, Gb, and Bbb make up an Eb Diminished chord. Find the notes of the Eb Major chord (Eb, G, and Bb). Lower the third one half step, turning the G into Gb, and lower the fifth one half step, turning the Bb into a Bbb. Using either process (beginning with a Major chord, or beginning with a Minor chord) results in the same notes, Eb, Gb, and Bbb, and make up an Eb Diminished chord. Let us now add the Diminished chord construct to our chart. Again, notice how closely related all the chords are, and how simply one can be formed, based on the notes from another.